ONL learning activities will involve inquiry into your own practice, scenarios and engagement in related discussion, shared reflection and learning through doing. You are in the driving seat of your learning and will need to define your intended learning outcomes and plan for learning for each topic, by yourself or within a group depending on the mode of participation. For each topic there will be an authentic scenario or choice of scenarios for you and your group to investigate. To guide your process of inquiry consider to use the FISh model (see below) which provides a structure for collaborative inquiry. As part of your learning, it is recommended that you start a learning blog where you can write reflections on your learning experience as you go through the course. For each topic there will be specific reflective tasks. Please consider sharing these with the ONL community in G+ and/or via Twitter. We arrange several webinars during the course, mainly using the platform Zoom. They normally take one hour and you simply log in just before the start. We aim to make these as interactive as possible so be prepared to contribute, mostly by chat but even with audio and video (requires webcam and headset). Full instructions for each webinar will be posted in the course community and on the main course site under each topic as we go along. During the course we will have 2-3 tweetchats where we will discuss aspects of the latest topic. A tweetchat is a discussion using Twitter where we meet for one hour and you can answer the questions set by the discussion moderator. By using a common hashtag (#ONL181) all contributions to the discussion can be seen in one common feed and the discussion develops as more people contribute. You can choose to participate using your own Twitter account or you can simply follow the discussion passively by going to https://twitter.com/ and entering #ONL181 in the search function. Full instructions for tweetchats will be posted in the course community and on the main course site. Participation in a PBL group is an essential and much appreciated way to study in ONL and a much of course activities will happen within these groups. During ONL181 there will be approximately 13 PBL groups with 7-8 members in each who will work asynchronously and synchronously during the course with support from a facilitator and a co-facilitator. Each PBL group have their own Google+ community for discussion and a Google drive folder for collaborative documents as well as an e-meeting room. Guidelines and templates to start up their work will be provided in each group. Below you can see an example structure for studies in a PBL group during a 2 week topic. Each group has a facilitator from one of the organising institutions and a co-facilitator who has recently completed the course as a participant. The facilitator will be there to support individual participants and groups if and when needed. The facilitators might be more hands-on at the beginning to help you coordinate the initial activities so that you can get started. Progressively, the facilitators will step back and let individuals and groups decide when they need her/his help. If you need help, please let the facilitators know via the ONL community in Google+. To read more about their roles view Facilitation in ONL. Within the framework of a Problem-Based Learning approach a simplified model for inquiry, called FISh, has been developed (Nerantzi and Uhlin, 2012). We suggest the use of FISh when working collaboratively with inquiry into scenarios in each topic. 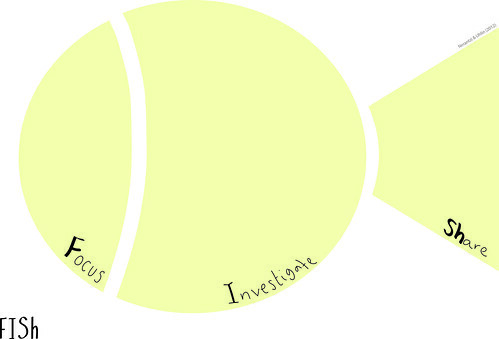 Even if you learn autonomously or with a learning buddy, FISh might help you as a structure for your learning process. However, remember that learning is messy and following or restricting yourself to a linear process might not work and can be frustrating at times. The FISh model has been developed by Chrissi Nerantzi & Lars Uhlin (2012), image designed by artist Ellie Livermore. I find the fish model valuable and easy to use. Having not tried it yet, the FISh model seems to be a constructive, comphrehensive and clear approach to learning to gain knowledge and to reflect as part of a community.